To Wi-Fi users, it is not uncommon to have bad experience on Wi-Fi performance, and antenna design plays an important role while evaluating wireless performance. Today, most access points on the market are designed with single static radiation pattern, typically for ceiling-mount. When an AP with ceiling-mount pattern is installed in wall-mount scenario, its signal coverage does not fit for wall-mount deployment. Adapting an AP with external antenna may be the alternative option, however, external antenna installation requires know-how for antenna selection, and would look awkward for interior decoration. A flexibly installed Wi-Fi AP with optimal performance and stylish outlook is a prerequisite today, but a satisfactory solution has been missing for a long time. Zyxel’s WAC6103D-I is a high performance 3-stream 802.11ac Wi-Fi AP featuring ultra-fast speeds of up to 1.75 Gbps with ground-breaking “dualoptimized” antenna design. Via the innovative adjustable antenna setting, the WAC6103D-I provides the best signal coverage fitting for either ceiling-mount or wall-mount deployments. Even better, the stylish, ultra-slim industrial design perfectly blends into modern decorations. Choose WAC6103D-I for constant, no-compromise Wi-Fi performance. Zyxel’s innovative “Dual-optimized” antenna design is a ground-breaking technology for both wall- and ceilingmount installations. Instant antenna adjustment either by a hardware switch or software configuration, the signal pattern adjustment is completed in seconds without skillful experience for antenna accessory selection and installation. The WAC6103D-I embedded with a “Dualoptimized” antenna is able to deliver truly optimal Wi-Fi performance in a range of installation scenarios. 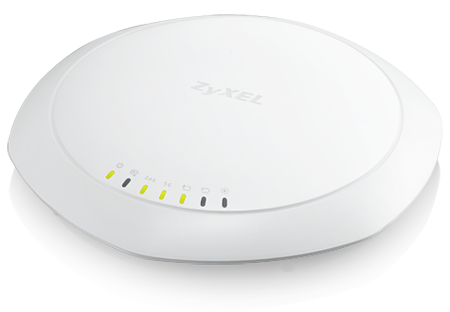 Zyxel APFlex includes Zero-touch AP mode changing and Automatic IP configuration functions. 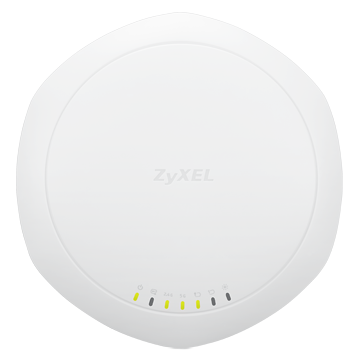 The Zero-touch AP mode setting detects if there is an existing Zyxel controller and to choose stand-alone or managed mode accordingly. The Automatic IP configuration removes manual configuration and allows the AP to set itself to fixed or dynamic IP address automatically. With these two intelligent features, IT administrators can skip the two critical settings that had to be handled manually on legacy products and focus to more critical configuration tasks instead. Zyxel Wireless Optimizer (ZWO) provides a powerful tool for centralized management covering initial planning, adjustment during deployment and after-sale maintenance of an AP network. Architects can simulate AP deployment on a map displaying the number of APs needed. During deployment, ZWO will also map actual signal coverage for architects to adjust their AP locations or configurations. After-sale, network administrators can access key performance details from ZWO, including channel in use, transmit retry rate and frame error rate, as well as the devices on the environment map. ZWO’s user-friendly presentation saves time and facilitates quick response to the network problems. Zyxel WAC6103D-I has been certified with industrial strength WPA2 enterprise protection and supports a wide range of Extensible Authentication Protocol (EAP) types. It can be seamlessly integrated with deployed corporate RADIUS servers. The Layer-2 isolation protects private networks among client users, allowing users to access their shared devices without entering the rest of a private network for enhanced security. In addition, the intraBSS blocking prevents different WiFi clients associated with the same AP from seeing each other and each other’s data. To streamline the management process, the WAC6103D-I comes with the Zyxel One Network (ZON) utility, allowing administrators to assign IP addresses to multiple APs through just one platform. Administrators can avoid the hassle logging into each AP to change the default IP addresses before physical installation. Ceiling-mount installation is the most common type of wireless deployments, and it is not surprising that most APs on the market are designed with single static radiation pattern for ceiling-mount installations. In wall-mount scenarios, the ceiling-mount radiation pattern would create interference with devices on upper and lower floors, meanwhile it delivers short-range signal for wireless clients at the AP front. Choosing an AP with external antenna may be the alternative option for wall-mount installation. However, the installation usually requires professional knowledge for antenna accessory selection and signal coverage fine-tune. Designed with the innovative “Dual-optimized” antenna, the WAC6103D-I adapts to both wall- and ceiling-mount installations. To boost Wi-Fi speed of your network, WAC6103D-I is definitely an excellent choice. The WAC6103D-I inherits the stylish honeycomb product design of Zyxel WAC6500 Series; its low-profile white blends perfectly into all kinds of decorations in many buildings with extraordinary modern tastes. The compact and elegant aesthetics makes WAC6103D-I flexible for different decors – no matter to be outstanding or just invisible. 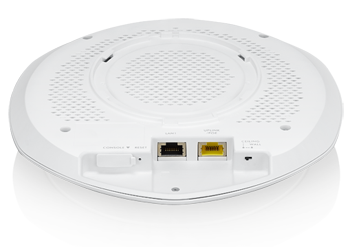 WAC6103D-I features APFlex to simplify managed/standalone AP mode configuration and to be integrated into the network environment automatically, which eliminates the need for pre-install preparation. Also, the ZWO (Zyxel Wireless Optimizer) Utility allows IT managers to perform AP planning, coverage detection and wireless health management centrally. ZWO’s user-friendly presentation saves time and facilitates quick response to the network problems. 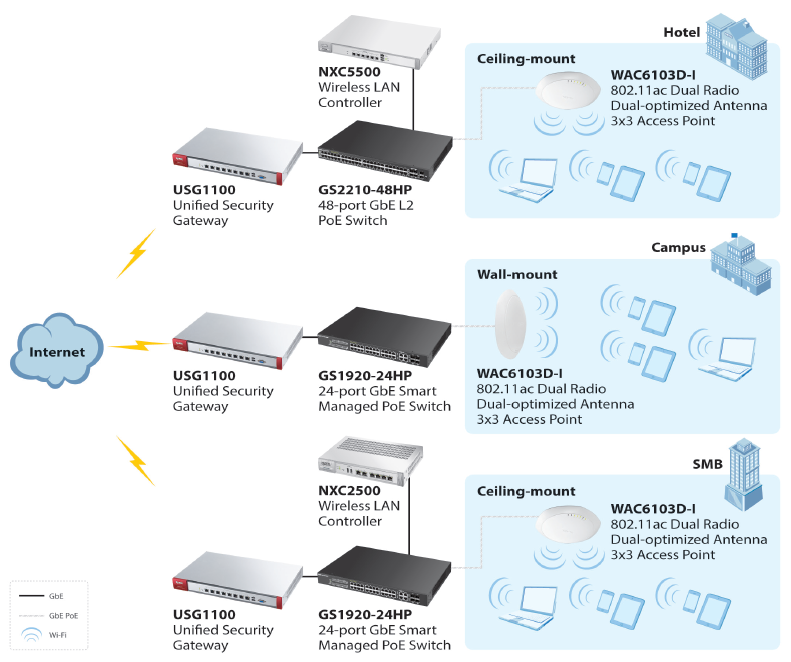 WAC6103D-I ensures to deliver optimized wireless experience for users with a range of wireless features such as Dynamic Channel Selection (DCS), Load Balancing, and Smart Client Steering etc. Dynamic Channel Selection (DCS) avoids the interference of co-channel and overlapping channel at initialization. Load Balancing enables administrators to set limits on the number of clients associated with each AP. Furthermore, Smart Client steering features with Band Select, Signal Threshold and Band Balancing for stable and reliable wireless connection. Band Select and Signal Threshold monitor the capabilities of each wireless client and steer them to the less congested band and better signal AP. Band Balancing detects dual-radio clients and distributes clients across 2.4 GHz and 5 GHz bands on AP. With these technologies, the WAC6103D-I delivers smooth, consistent and uninterrupted wireless access experience. *Max. power draw is 12.48 W. In extreme cases, the inrush current is greater than 802.3af limit, thus 802.3at PoE is required. Tradiational APs typically are with single static ceiling-mount radiation pattern, while the APs deploy in wall-mount scenario, the radiation pattern would create interfloor interference and deliver short-range signal for wireless clients at the AP front. Different from those traditional access points, Zyxel's innovative "Dual-optimized" antenna design is a ground-breaking technology, offering adjustable antenna patterns fitting for ceiling-mount or wall-mont scenario without compromising performance. Noises between RF circuits usually impact performance, and it's a critical EMI challenge too. 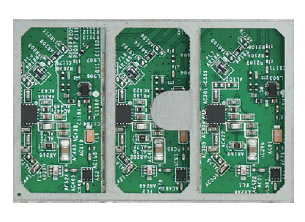 The WAC6103D-I isolates RF circuits by solid shielding frames. Thus, electromagnetic interference (EMI) is mitigated while RF performance is enhanced as well. 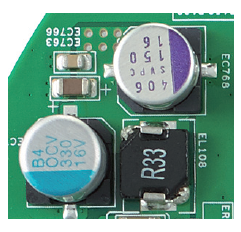 All-solid capacitor design provides up to 6 times lifespan than electrolytic capacitors. No more exploding capacitors that fail the AP, so better stability and reliability can be expected. Download the Zyxel WAC6103D-I Datasheet (PDF).